Minnesota’s flag is a bit of an eyesore, ranked at the bottom of subnational entities in North America. We can fix that! My concept shares a similar central element to the current flag, while being simpler and more distinctive. The North Star is represented by a golden eight-point star, similar to a compass rose. Here, I’ve included some titling to de-emphasize the South, West, and East points. The white ring is an element of continuity from the present flag; at a glance, at a distance, they will appear quite similar. The way the star’s rays pierce the white is technically a violation of heraldry rules about ‘tincture’, but I think it’s distinctive enough Titling is also generally frowned upon in proper heraldry. A more revolutionary redesign might also axe the titling and use a less commonly-seen star, say ten points of equal weight for the land of ten thousand lakes. 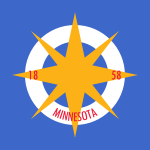 Of course, I’m not the first to think that the Minnesota flag is terrible. There was a strong push in the late 1980s to change it, but it didn’t quite work out. 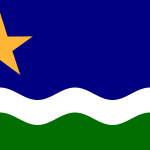 The one with the Green is called the “North Star Flag” and was designed by Rev. William Becker and Mr. Lee Herold. This entry was posted in General, Projects by j5mc. Bookmark the permalink.